This is plate 24 from Charles Ramus Forrest's 'A Picturesque tour along the rivers Ganges and Jumna, in India'. Forrest was an East India Company official who made several excursions along the great rivers, producing drawings "attentively copied from nature, and in many instances coloured on the spot, ... while the magic effects of the scenes represented were still impressed on [his] mental vision." Forrest was part of the British legation sent to negotiate with Maharaja Ranjeet Singh of Punjab in the early part of the 19th century. On their way, they stopped at Delhi and Agra where Forrest visited several monuments and buildings, including the Taj Mahal. He described it as being "of the highest beauty and interest of any structure yet raised and perfected by man in any region of the earth ... 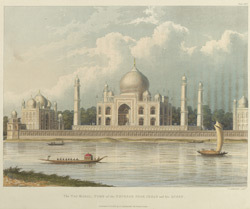 The Taje appears embosomed in a mass of foliage of a deep green at the further extremity of a large and handsome garden, with its lofty and elegant minarets, and its dome of extreme beauty an airy lightness; the whole of the purest white marble, richly inlaid in patterns of the semiprecious stones, as cornelian, jasper, onyx, and a variety of others of all hues".